The food has gotten rave reviews, and I can’t imagine anyone disagreeing that the rustic, farm-house interior provides a delightful and homey setting for enjoying a delicious meal. And as an inventive, smart and attractive restaurant situated in a neighborhood more often known for shenanigans like this, Mintwood Place truly stands out. On my second visit, at about 10pm on a Saturday night, the bar at Mintwood Place was, refreshingly, not packed to the gills with AdMo party-goers. I, along with three friends, found 4 stools at the bar and were offered a great assortment of drinks and food. Let’s just say that the Colonel Bartlett Rickey was the most refreshing cocktail you could possibly hope for, especially when the temperature was barely dipping below 99 degrees. I am always slightly wary about ordering food from a bar, as I’ve found many bartenders to be less knowledgeable, and almost always busier than regular servers. 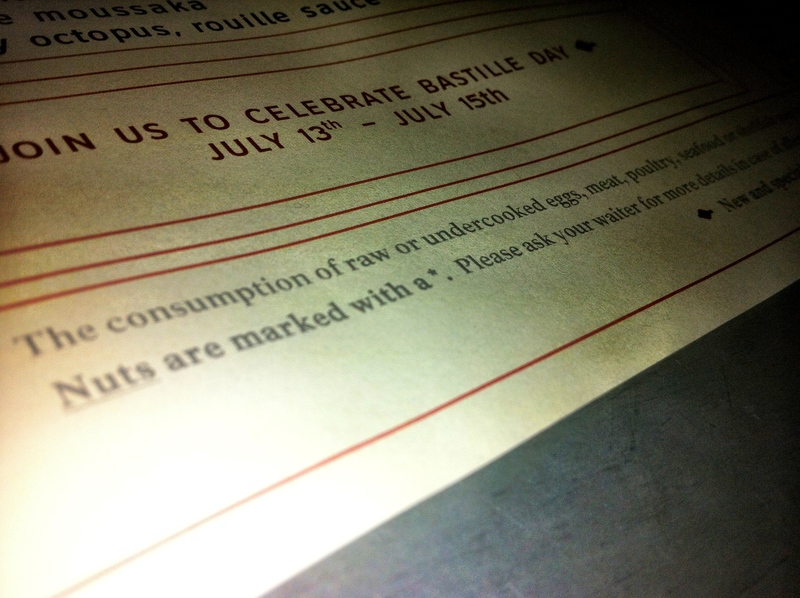 But check out the menu disclaimer! For those of us with nut problems, Mintwood specifically notates every item with nuts, and explicitly asks its customers to inform the staff of allergies or dietary restrictions! To me, this indicates that the restaurant is cognizant of the severity of allergies, and legitimacy of any kind of dietary restriction—a responsible and timely business practice. Good form, Mintwood. As we were ordering our first item (not the escargot hush puppies, unfortunately, due to my corn intolerance), the pickled deviled eggs, I informed our bartender of my allergy, and urged that he let me know of any problems that might cause with our order. Soft-spoken, yet poised, he assured me that they didn’t use peanuts or corn in the dish we had selected, and that I would be completely safe. Thank goodness – because they were delicious. We ordered a second drink, and that would have been it, had we not smelled the fries from a fellow bargoer’s plate. Rumor has it (later confirmed by our bartender) that the potatoes are dipped in beef tallow before frying. Ummmm…yes. As fried foods are often the culprit in my allergic reactions, I asked one more time, specifically about the peanut oil issue. Again, our accommodating and understanding bartender assured me about the safety of the food—and its deliciousness. He wasn’t kidding. I could have used 3 more orders of those fries. What are your experiences with ordering food from a bartender? Are they knowledgeable? Are they able to duck out momentarily to go ask the manager or chef? What kind of training should bartenders be receiving? 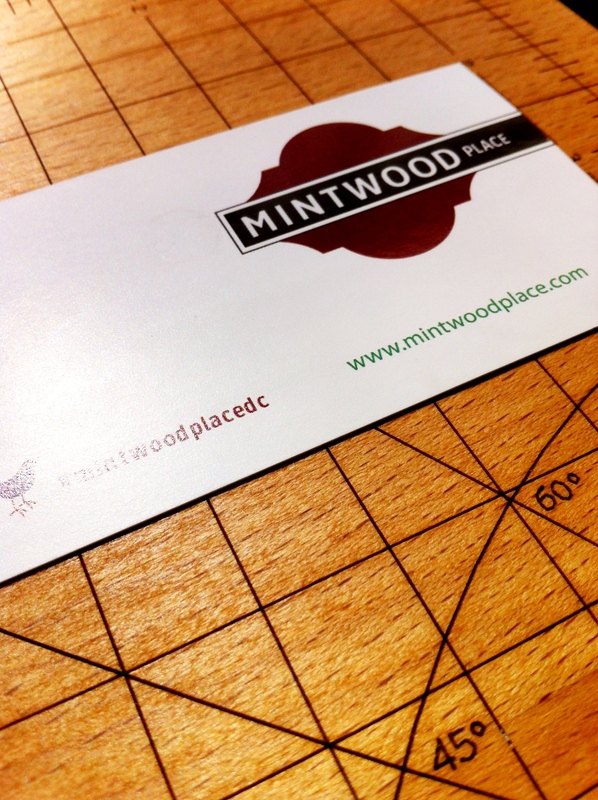 NOTE: I went to Mintwood Place again this weekend, and feasted on gazpacho, goat cheese & beet mountain pie, blistered shishito peppers, and tagliatelle bolognese. The food truly speaks for itself here.